Recently, I had a long chat with someone who is going through a rough time dealing with the reality of a tough choice. This conversation has left me a shaken as I have empathy for him, and his situation. Imagine you are standing at the edge of a pier with a “rope like object” in your hands. In the water around you, their are several people who are in trouble and close to going under. 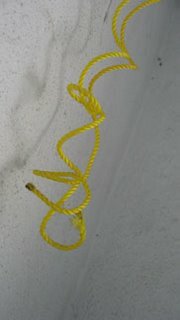 You think the “rope like object” might help to save some but you are unsure as it has not been tested. Whom do you choose to help? Do you toss the rope to the people at the greatest risk of loss or do you help those with the greatest chance for survival? What happens if the rope fails all together? By choosing the ones with the greatest risk of loss over the ones with the highest chance of survival, allows the ones with the highest chance of survival to go under, and you may still loose the ones with the greatest chance of loss. The reality of “whom do you choose” is quickly setting in. Once you make the choice, how do you deal with the emotional ramifications that feel like a crushing load on your chest? Could you look the unlucky families in the eyes and say “I am sorry, but I decided to help others over your loved ones”, oh the rationalizations that would erupt into our minds to protect our souls from despair. But the people you did not help were in no worse shape then when you found them…right?? ‘This was not my fault and my actions did not change their situation – I have no responsibility here!’…will that logic work for you in the middle of the night? I think not. A simple fact: it is not possible to save everyone, no matter how hard we try. Stretching beyond ones abilities to help others often destroys both parties. No matter what choice is made, the rational side will eventually take its leave from you so guilt may come and pay its call. I do not envy the people who have to make the “tough” calls in life. Doctors, medics, firefighters, police, and others who make these hard life-altering decisions. My hat is off to you and my heart felt respect for what you do. I am sure these decisions may haunt, or bring joy, to their souls forever. However, I am not sure which one it would be for me, joy for helping some or regret that I did not save all. You must find peace with your decisions as it is not possible for past events to be altered. Dawn approaches and it will be soon time to move on. I hate to say it, but this will not be the last crossroad you will experience in your life. Be careful not to harden your heart, too much, as it will eat you from the inside and close off the ones that you are closest too. No words of wisdom or grand insights into the human condition. I do feel that Life is Life, and without the boundaries it would have no meaning. Trying to control the uncontrollable is an exercise for the foolish and insane. We do the best we can, for as long as we can, and then let the cards play themselves out.